The Staunton chessmen design was registered on 30 March, 1849, by Nathaniel Cooke and first offered to the public for sale in September of that year. It is well known that Jaques was the exclusive producer of the Staunton chessmen and that these chessmen were made in Boxwood and Ebony as well as “the finest African Ivory”. But did Jaques also “produce” the Staunton chessmen in Wedgwood Carrara or in Boxwood and Rosewood? There is ample evidence that Jaques advertised the availability of the Staunton chessmen in a material, referred to as “Carrara Marble” and produced by the well known Wedgwood Company. However, there seems to be some question as to whether the chessmen advertised as “Carrara Chessmen” were ever produced or, if they were, were they made by Wedgwood. What still remains to be determined is whether the Carrara chessmen were actually produced by the Wedgwood company, since they do not bear the Wedgwood mark (at least, the four existing pieces don’t). Perhaps only the King bore the Wedgwood mark, but since an example of the King has not yet been seen, that question can’t be answered with certainty at this writing. According to Robert J. Reichner, a Wedgwood dealer and a director of the Wedgwood society of New York, there are no known records in the Wedgwood files on the Carrara chessmen or any Staunton pattern chessmen that might have been produced by them. However, in an article written by him in the 1990 annual issue of Art Ceramica (#7), there is an interesting paragraph on page 26.Figure 1 provides physical proof that these Carrara “Marble” chessmen were not only mentioned in numerous advertisements, they were actually produced. Of the four pieces in existence, one Knight and one Rook bear the mark of a King’s crown on their summits. That mark is identical to those found on the early Jaques ivory chessmen shown. While not identifying the chessmen specifically as Staunton pattern, the 1849 dating of the chessmen would seem extremely coincidental. Since only four of the white chessmen have been discovered to date, the color or colors of the opposing army are not known, although it is believed that they were “delft” blue. 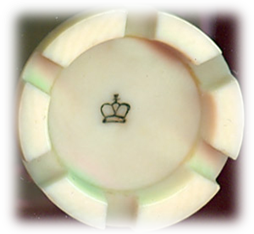 Of particular interest is the registration stamp which has been fired into the base of each of the chessmen. This is shown in Figure 3. 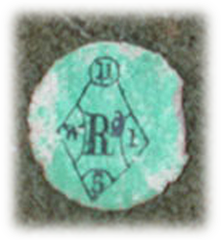 Comparing this stamp with the lozenges found on the early Jaques chessmen, it will be noticed that the correct fields are present. There were actually three versions of the green lozenges that were affixed to the base of the early Jaques chessmen. The earliest, shown in Figure 4, had the “S” field missing, but everything else was correct. The next version, shown in Figure 5, was correct, except for the backward “5”. The correct lozenge is shown in Fig. 6. 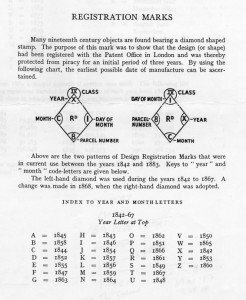 The Office of the Registrar of Design prescribed the data to be shown in the registration mark. This was done in the “registration certificate” that the Registrar of Designs signed and attached to the duplicate copy of the design drawing that was returned to the Proprietor when his application was granted if the application complied with the terms of the 1842 Ornamental Designs Act Class II Act. 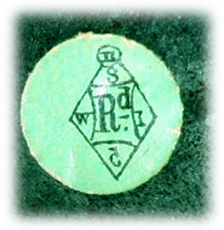 Since it was the responsibility of the proprietor of the registered design to produce the lozenge design and affix them to the chessmen, the printed green discs bearing this registration mark would have been designed by Nathaniel Cooke, who was probably the culprit responsible for the errors in the first two printing of the registration stickers. 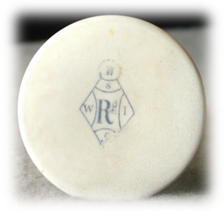 The registration mark stamp for the Carrara chessmen would have been the responsibility of the producer, Wedgwood. They got it right the first time. I HEREBY CERTIFY that the DESIGN of which this is a copy was on behalf of Nathaniel Cook of 198 Strand London, REGISTERED this thirtieth day of March 1849 in pursuance of the Designs Copyright Act, 5 & 6 Vict. 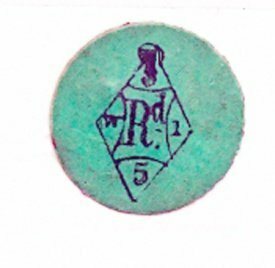 c.100, in respect of the application of such Design to ornamenting Articles comprised in WOOD Chess-men for which a COPYRIGHT is granted of thirty six MONTHS. The registration mark was required to identify the goods as being duly registered and was limited to a three-year period of coverage. Interestingly, the registration mark on the Staunton Chessmen only covered articles in wood. Affixing the mark to ivory or Carrara Staunton Chessmen was probably done inadvertently and constituted an unlawful abuse of the Act. Explanations of the fields on the mark are shown in figures 7A and 7B. The only known box which housed the Carrara chessmen is the Carton Pierre casket with the Staunton hand-signed label with the hand-entered number “24” shown in Figure 8. This would signify that this was the 24th Staunton set produced by Jaques, not the 24th set of Carrara chessmen. Since the advertisements for the Carrara chessmen do not specifically mention size, it can be safely assumed that they were only made in one size. That would correspond to a King height of 8.9 cm based on the scale of the other four chessmen from the part set. It is worth noting here that Jaques specified the size of their chessmen by the base diameter. This is a much better metric than King height, since the latter can be greatly affected by the size of the King’s finial. Pre turn-of-the-century Jaques chessmen typically had much smaller King’s cross finials than their contemporaries. There are numerous ads for the Staunton chessmen in The Illustrated London News (ILN) as well as other prominent news papers. A sampling of these ads is reprinted herein. The “revolutionary” new Chessmen were first formally advertised in the September 29, 1849 issue of the Illustrated London News (ILN) on page 223. Registered No. 58, 607, 5th and 6th of Victoria, cap. 100. In Wedgwood’s Carrara, with the Carton Pierre Box and new Treatise … £2; 12s, 6d. Note the use of the reference to Wedgwood’s Carrara. 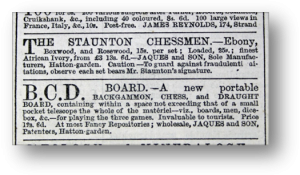 Then there is the following advertisement for the Staunton Chessmen that appeared in the December 29, 1849 issue of the ILN, page 447. Here, here are some interesting snippets from Howard Staunton’s weekly column in the ILN from 1849 and 1850. 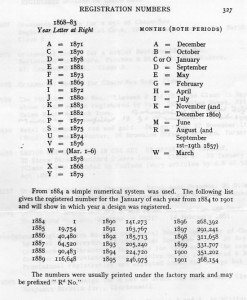 Note Staunton’s April 27, 1850, reply to Belgravia in the ILN. Here, he clearly links the production of the Carrara chessmen with the Wedgwood factory. That location is also referenced in Reichner’s Art Ceramica article and is amply supported in the literature. Retail outlets where the Carrara chessmen might be purchased are also clearly identified in various ads between 1849 and 1850. ILN, Sept. 22. 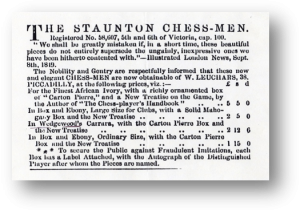 1849; Pg 355: THE STAUNTON CHESSMEN – In reply to numerous enquiries as to when-and-where the new Chess-men can be obtained, we are requested by the proprietors of them to state that the delay in their publication is occasioned solely by the efforts making to render the men in every respect deserving the extensive patronage they have the promise of securing, and that the sets complete in Ivory, Carrara Marble, and Wood, including a beautifully characteristic box of “Carton Pierre,” and a new treatise on the game by the author of the “The Chess-Player’s Handbook,” will be issued to the trade on Saturday next, the 29th. Two additional ads with the Carrara Marble Reference are shown below. Since the ads for the Carrara chessmen only appear for six months or so, it can be concluded that these sets were not manufactured in large quantities and that they were only produced during the first year of the production of the Staunton chessmen. It is not known why production was discontinued. However, several scenarios can be postulated. First and most obvious is that the brittle nature of this material precluded their being used for serious chess play, no doubt occasioned by numerous pieces being returned for repair or replacement. The material would have been expensive to fabricate, fragile and easily soiled – not an ideal endorsement for a serious playing set. 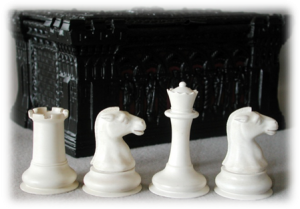 It is hard to imagine that there was much demand for playing chessmen in such a material. A second possibility is that both Jaques and Wedgwood wanted their mark on the chessmen and couldn’t find an acceptable compromise, so their production was discontinued. The former would seem to be the most compelling explanation. Given the existence of the chessmen, the Carton Pierre casket, the numbered manufacturer’s label, along with identified retailers and the numerous ads and the references to Etruria, the Wedgwood factory in Staffordshire, there is ample evidence to support the thesis that not only were the Carrara chessmen advertized, they were produced and sold, albeit in small numbers, and they were produced by Wedgwood in their Staffordshire facilities. Although conclusive evidence has been presented to prove the existence of the Carrara chessmen, the question as to whether Jaques also produced Rosewood Staunton chessmen remains un-investigated. Mentions of this have been omitted in the literature, likely due to insufficient or hurried research. As a result, the issue has never been subject to study or informed debate. One simple, though hardly rigorous, argument is that a single example of a Jaques Rosewood Staunton chessman has yet to be found. Nor have any Jaques maker’s labels been found indicating that the chessmen were produced in Boxwood and Rosewood. The question arises with the discovery of ads offering Jaques Rosewood Staunton chessmen which appeared in the newspapers and elsewhere for a few months in 1859. One such ad is shown next. It appears in the Illustrated London News of 16 October 1859 (page 364, column 2). This ad was repeated in the same newspaper on 22 October 1859 (page 388, column 3), 5 November 1859 (page 453, column 3) and again on 12 November 1859 (page 477, column 3). One question that should be addressed is “How can you be sure that Jaques never produced Staunton Chessmen in rosewood if you have not seen all of Jaques wooden chessmen?” There are several good reasons to believe that Jaques never produced and marketed Rosewood Staunton chessmen. First, none have ever been personally seen; although many thousands of branded Jaques wooden Staunton sets have been viewed by numerous collectors over the years. Remember, Wedgwood Carrara pieces, which are extremely rare, have now been seen. However, not a single Rosewood Jaques Staunton chess piece has ever been found. Without a hard example, the thesis that they were produced is difficult to prove. 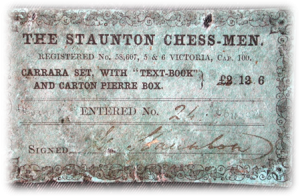 Second, aside from the single third party advertisement referenced above, Jaques never advertised Rosewood Staunton chessmen in their catalogues or newspaper ads, nor did any such references ever appear in either Staunton’s Chess-player’s Text Book or Harriet Ingram Cooke’s The ABCs of Chess. Finally, every pre-1862 Jaques Staunton label seen to date has Ivory, Carrara or Boxwood and Ebony printed on them. However, no Jaques Staunton label has ever been seen by the collector community with the words Boxwood and Rosewood printed on them. been the case that the writer of this ad simply made a mistake. Since Rosewood was used in Jaques non-Staunton lines appearing in ads for their chessmen, the writer of this ad might simply have made the leap to Jaques’ producing Rosewood Staunton Chessmen. Given the fact that no one has ever seen a Rosewood Jaques pre-WWII set, the simplest explanation is that this was an error in the ad. Any relevant evidence proving or disproving the existence of Jaques Rosewood Staunton chessmen would be a good topic for future research on the subject. Ample evidence has been presented to support the existence of the Carrara chessmen and the assertion that they were produced by Wedgwood at their Etruria facility in Staffordshire in 1849. On the other hand, there is absolutely no evidence aside from a few questionable third-party ads, that Jaques ever produced its Staunton pattern chessmen in Rosewood. Presented at the May 23 to May 26, 2013 Annual Meeting of the CCI-US in Baltimore, MD. By Frank A. Camaratta, Jr.
@ Copyright, 2013, Frank A. Camaratta, Jr.